September's swap is to decorate a jigsaw piece. But, this time, I'll provide a template for you to print onto card, cut out and use. It's about 5 inches, so a good size to get stuff on. 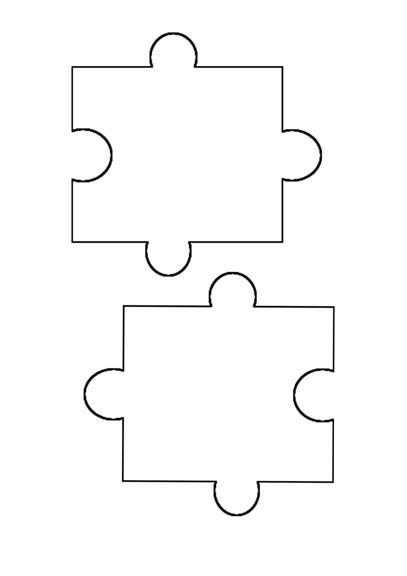 Decorate one piece of jigsaw (or two if you want to join them) in any style you want. Jigsaws to be with me by Wednesday 26th September. This is the template, but to get the full size, go HERE. (if you get an ad', just skip it with button on right). Yes please, glad you got the size up there too, I can check I've got it right before starting. How do I print it? I can copy and paste it but then it comes out enormous and I have to resize it. is it 5" top to bottom of the page? Done it, I had to open in another tab or something like that. Karelyn, have you downloaded the file from 4shared? That will be the correct size. Can you email the doc? Downloaded fine thanks Lorraine. Please add me in to this one. I love doing jigsaw pieces! It didn't showing me what is going to down load the first time I went in and the second time it some music, so didn't do a download. Billie - PM me your email address and I will email it to you this evening as I have it on my computer all ready to go. Hmmmm, sorry some of you are having trouble. YOu should only be getting one ad page that you can skip and then go straight to download, but I'll email it to whoever wants it that way. Billie, are you joining the swap then hun? Thanks Patty, but I've emailed Kate and Billie. Yes I did Lorraine, but when I right clicked it to print it didn't give me that option until I opened in another tab, the pieces measure 7x7cm ish each is that right? 2.75"
No, each piece is about 5 inches Karelyn. You have to actually download the file (download button under the pic) to your computer hun. Yes please - include me. OK Lorraine, I have got it downloaded, so will look at that, thanks for bearing with me on this. No prob Karelyn, and yes Ruth, that's fine if you want to use your own. Thanks for the e-mail Lorraine, but I'm sorry won't be able to do it, eyes not up to scratch. done and in the post! can someone email me the piece please as i have clicked on every download butoon on the page and am being asked to join something which i dont want to do !!! On its way Kim. Can't understand all these links you girls are getting. That's NOT supposed to happen. Sorry. Done..assuming you're still at ntlworld. Patty, yours is here hun. It's smashing, made me think of Ken. Well the original item in question is one of his, of course!! Get it done and in the post Kate.